5 years & up. Your Shopkins are ready to roll into the tea room for a charming tea party with these stylish, tea-themed Cutie Cars. 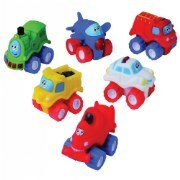 Cars Feature cute faces with ears and a die-cast body with fun tea brake themes. 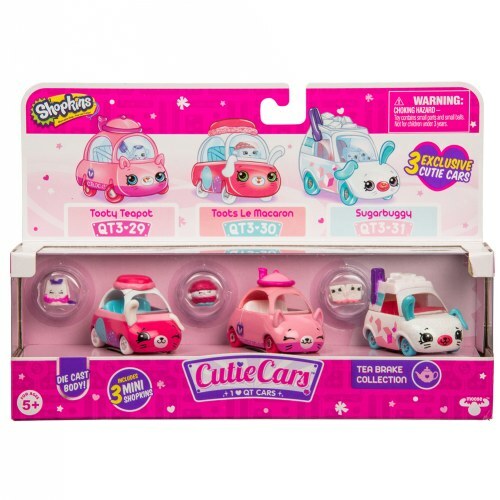 Set Includes 3 unique Cutie Cars with Shopkins: Tooty Teapot the Buggy Buddy with a tea bag Shopkin, Toots Le Macaroon the Buggy Buddy with a macaroon Shopkin, and Sugarbuggy the Cutie Coupe with sugar cube Shopkin duo. Also includes a collectors guide.